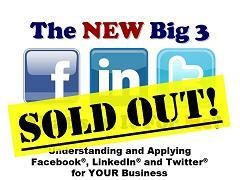 If you waited to make your reservation or you thought you could stroll up to the door, sorry but the presentation of The New Big 3: Understanding and Applying FacebookÂ®, LinkedInÂ® and TwitterÂ® for YOUR Business is very sold out. It’s the first sold out dinner meeting in many, many years for the Buffalo Niagara Sales and Marketing Executives. 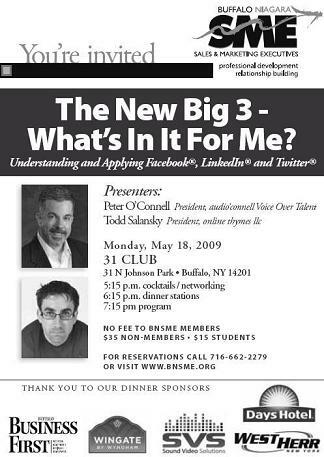 So I had mentioned a while back that I was going to help do a presentation on Social Media for the Buffalo Niagara Sales and Marketing Executives on Social Media that I titled “The New Big 3”. I even had lunch this week wit Todd Salansky, my co-presenter to go over our talk. Well Friday night I am reading my copy of Buffalo Business First when I turned the page to see myself staring back at me. 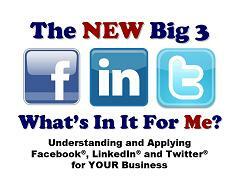 It was an ad for “The New Big 3” presentation that I didn’t even realize the association was running. I can’t help but laugh at how amazingly unnerving it is to see one’s picture in a publication when one isn’t at all expecting it. A complete “what theâ€¦?!! !” moment. If you can join us, we’d love to see you on May 18th.